This Square Table Linen Has 70" Long Sides! This Restaurant Tablecloth Heightens the Overall Aesthetic of the Dining Facility! Made entirely from polyester fabric to last a long time. Black coloring is sharp but neutral for an attractive addition to most settings. Material is washing machine safe for easy cleaning. These square table linens feature an attractive and durable exterior that will improve the ambiance for a long time. The polyester tablecloths are rugged enough for cleaning in the washing machine. 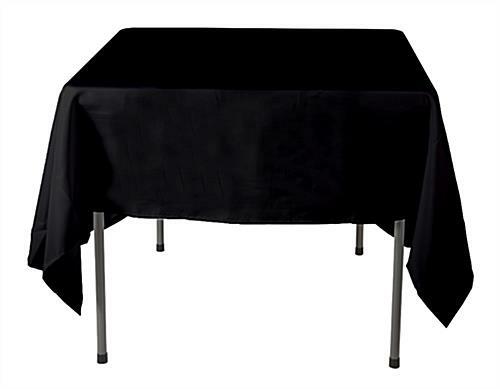 These flame retardant square table linens, also called restaurant covers, have the black exterior that is neutral, but very elegant. The polyester tablecloths prevent against wrinkle, so the tabletop will always appear clean and tidy. These square table linens are 70" x 70" in size to fit many tables. The restaurant covers work well in high class and casual eateries.